One look and you instantly know these scones are full of flavor. Molasses and ground cinnamon, ginger, and cloves give these Gingerbread Scones their earthy brown color. But it doesn't end there. They also contain rolled oats (which gives the scones a more hearty flavor and chewy texture), crystallized ginger (to add a little sweetness and heat), and some dried fruit (can use raisins, dried cranberries or dried cherries). You can enjoy one on its own, or cut one in half and spread each side with butter and jam or even with some lemon curd. A few notes on ingredients. Molasses is usually labeled as "sulphured" or "unsulphured" depending on whether sulphur was used in the processing. My preference is to use unsulphured molasses as I like its lighter color and milder flavor. 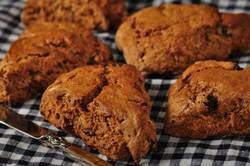 Molasses is used to add color, moistness and flavor to the scones. For the liquid part of the scone dough we are going to use buttermilk, which gives us a lighter, more bread-like scone. Buttermilk has a nice thick creamy texture with a rich tangy buttery taste that makes baked goods tender. In the past buttermilk was made from the liquid left over after churning butter, but it is now commercially made by adding a bacteria to whole, skim, or low fat milk. You can make your own buttermilk by adding 1/2 tablespoon of white distilled vinegar, cider vinegar, or lemon juice to 1/2 cup (120 ml) of milk. Let stand 10 minutes at room temperature before using. I have also provided a recipe for an optional maple glaze that can be drizzled over the baked scones. This adds wonderful flavor to the gingerbread scones. Oats are a cereal grain that is rich and flavorful and comes in many forms. They are very popular in Northern Europe, Scotland and Ireland. Oats are first cleaned, toasted, hulled to become what we call oat groats. The oat groats are then steamed and flattened to become rolled oats or old-fashioned oats. Old-fashioned rolled oats are not to be confused with quick-cooking rolled oats. These are oats have been cut into pieces before being steamed and rolled into thinner flakes. You can use either type in these scones. Gingerbread Scones: Preheat your oven to 400 degrees F (200 degrees C). Line a baking sheet with parchment paper. Or you can lightly butter your baking pan or spray it with a non stick cooking spray. In a large bowl, whisk together the flour, oats, sugar, spices, baking powder, baking soda and salt. Cut the butter into the flour mixture with a pastry blender or two knives. The mixture should look like coarse crumbs. Stir in the crystallized ginger and dried raisins, if using. In a separate bowl mix together the buttermilk and molasses. Add to the flour mixture and mix just until the dough comes together. Do not overmix. Transfer to a lightly floured surface and knead the dough gently and then pat into a 7 inch (18 cm) round. Cut this circle in half, then cut each half into 4 pie-shaped wedges (triangles). Place the scones on your baking sheet and brush the tops of the scones with a little cream or milk. If desired, sprinkle the tops of the scones with some rolled oats. Bake for about 18-20 minutes or until golden brown and a toothpick inserted in the middle comes out just clean. Transfer to a wire rack to cool. Glaze: In a small bowl combine the powdered sugar with the maple syrup and add just enough cream to make it of pouring consistency. With a spoon drizzle the glaze over the tops of the scones and let dry.